“The idea was to create a kindergarten where children go with joy,” Mr Chapidze said. There are around 1,500 buttons in the small Soviet-era plane’s cockpit which the children can play with as they imitate real pilots taking off. 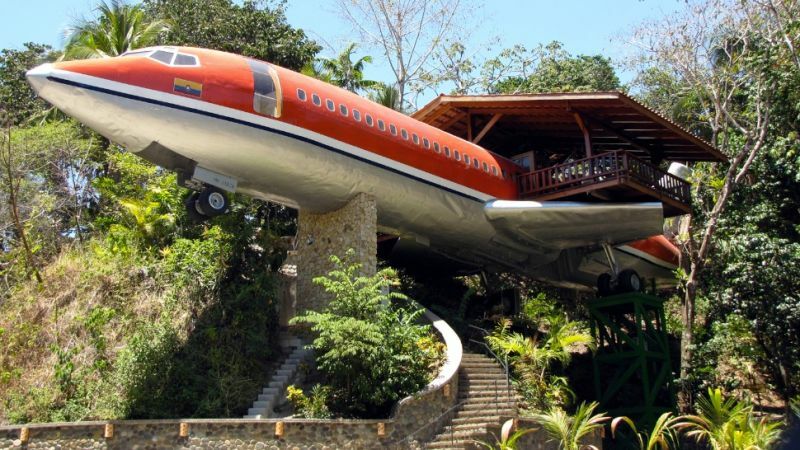 This vintage 1965 Boeing 727 airframe belongs to a Costa Verde hotel located in Costa Rica. In its prior life shuttled globetrotters on South Africa Air and Avianca Airlines (Colombia). This fully outfitted, meticulously detailed, two bedroom, Boeing 727 fuselage suite jets out from the jungle canopy, affording you views that will make you feel like you’re flying. This airframe was savaged from its San Jose airport-resting place. It was carefully transported on five big-rig trucks to the jungles of Manuel Antonio where they have been resurrected into a unique jumbo hotel suite. The classic airplane, nestled on the edge of the National Park, is perched on a 50-foot pedestal. At this height, you can enjoy scenic ocean and jungle views from the hard wood deck built atop the plane’s former right wing. If you cannot afford to buy an entire plane or you simply do not have space for it, a company called MotoArt specializes in custom designed home and office furniture so you can feel in the air 24/7. Their products vary from shelves, coffee tables, desks, reception areas to beds, couches and sculptures. Anything you can imagine, they have it for you. Bruce Campbell bought his Boeing 727-200 back in 1999 for $100,000. He spends 6 months a year living, working and refurbishing his 727 home in Oregon, United States. Bruce has worked with as much of the original material of the plane as possible, but improvises when there is a need. This on-going project is more than a hobby for Campbell, it is his passion. This 747 bed and breakfast hostel is located at the entrance of Arlanda airport near Stockholm. If you ever dreamed of spending a night in a 747 on ground, here you can do it. this big JumboStay has a total of 27 rooms and a capacity of 76 beds. The airplane, a decommissioned model 747-200 jumbo jet built in 1976, was last operated by Transjet, a Swedish airline that went bankrupt in 2002. It was originally built for Singapore Airlines and later served with legendary Pan Am. In Summer 2008, the plane was towed to its final destination at the entrance to Arlanda where it was placed on a concrete foundation with the landing gear secured in two steel cradles.